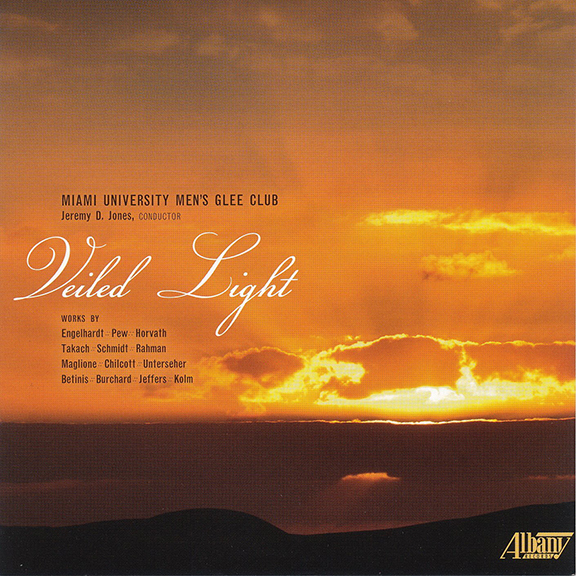 The Miami University Men’s Glee Club recording “Veiled Light” will be released for national and international distribution Aug. 1 by the Albany Records label. It is the first professional recording on a record label in the history of the Men's Glee Club – and of any student ensemble at Miami, said Jeremy Jones, conductor, assistant professor of music and Naus Family Faculty Scholar. Albany Records is devoted to American music that is “uncommonly classical” with “interesting, imaginative releases” and many world premieres, according to the label. The label is “a perfect fit for us given that our disc features 12 American composers and five professional recording premieres,” Jones said. The song “Wedding Qawwali” by A.R. Rahman, two-time Grammy and Academy Award-winning composer and musician, is also included on the CD. The Men's Glee Club, with conductor Jeremy Jones, center front, during the week of recording "Veiled Light." “Five works were specifically written for the Miami University Men’s Glee Club in its mission to promote and foster the creation and development of new choral works for male choir," Jones said. “Veiled Light” was recorded May 18-23, 2015, in Hall Auditorium. It was produced by Steve Barnett and engineered by Preston Smith, both of Minneapolis. Barnett and Smith are both Grammy Award-winning artists with credits that include recordings of all-male professional ensembles Chanticleer and Cantus, among other world-class music ensembles. The album will be available for purchase through Albany Records and on iTunes, Arkivmusic, Naxos and several other outlets. It is available for preorder on Amazon. The Men's Glee Club at the Intercollegiate Men's Choruses national seminar in March. 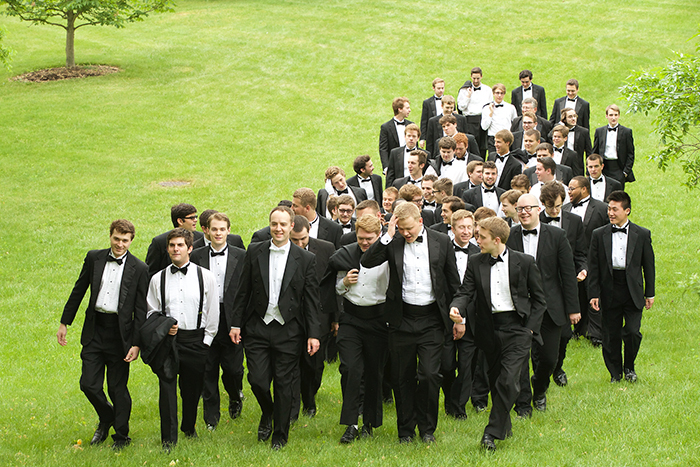 More than 100 singers — selected by audition from all majors across campus — comprise the Men’s Glee Club. Formed in 1907, it is among the oldest and largest groups of its kind in the nation. The ensemble performs on campus and has performed in Belgium, England, France, Luxembourg, Germany, Switzerland and Wales. Jeremy Jones: "The arts play a vital role in the education of all students across campus." 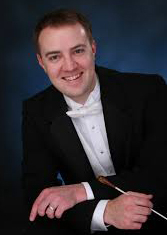 In 2008 Jones was invited to present his doctoral dissertation research on male choral singing at the Intercollegiate Men’s Choruses National Seminar hosted by the U.S. Army Chorus and the Washington Men’s Camerata in Vienna, Virginia. That visit was the start of Jones’ Miami experience. I attended an afternoon concert the night before my presentation that featured three collegiate men’s glee clubs: University of Pittsburgh, Penn State University and Miami University. I am not originally from Ohio and, although I was attending the University of Cincinnati College Conservatory of Music at that time, I did not know anything about Miami University. I recall sitting in the balcony, watching the Miami University Men’s Glee Club take the stage and give a brilliant performance. Little did I know, two years later in April 2010, as I was completing my doctoral studies, Miami University posted this job announcement. I was fortunate and blessed to be given the opportunity to interview for the 2010 visiting assistant professor position. I immediately had the feeling once I arrived to campus for my interview this was where I wanted to serve. I was drawn to the students, colleagues, and overall mission of Miami University. I was offered an assistant professor tenure-track position in 2011, and since then, I’ve been living the dream. Twice now, I have returned on tour with the Men’s Glee Club to the very city and church where I first heard of the Men’s Glee Club and Miami University in 2008 – Vienna Presbyterian Church in Vienna, Virginia, where I also had the great honor of collaborating and guest conducting the U.S. Army Chorus.